Eating in Ferrari’s is like a visit to sunny Italy. It’s fun, it’s enjoyable and a great place to relax. Ferrari’s offers superbly prepared Italian food in modern, stylish surroundings where efficiency and hassle-free service predominate. The menu includes thin base pizzas cooked in a traditional oven and an extensive range of fresh pasta dishes. Open Mon-Sat noon-2.30pm and 6.30-10.30pm, Sunday open all day. All major credit cards accepted. 10% service charge. 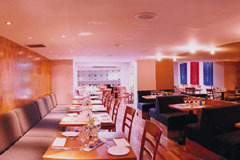 A range of modern Italian dishes including fresh pasta and pizzas.